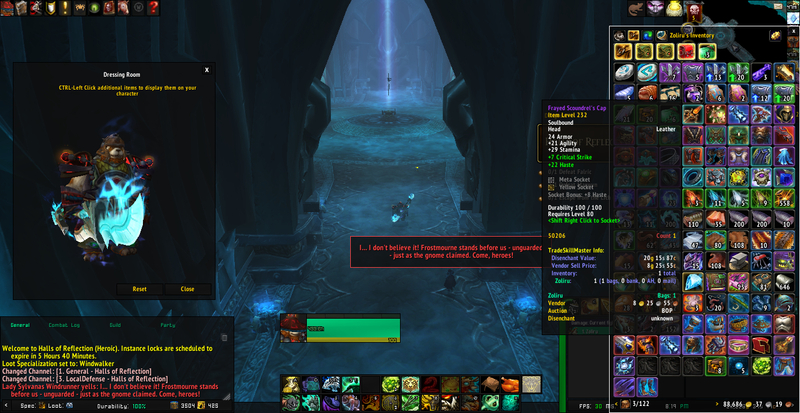 Drops from Devourer of Souls in heroic Forge of Souls. Despite the horrible looks, the stats are decent for Feral DPS. Yellow socket's a bit of a toss-up, though it helps with the low frequency of hit rating on these tiers of gear. As bad as this looks, would it not be a decent helm for mutilate rogues due to the haste and crit? Seems to be better vs Hood of Lethal Intent assuming you don't need the hit. Bah! I feel horrible to admit this, but. . . . I've needed on this twice. I know. I know. The first time I briefly looked at the stats (mostly item level) and thought, why not. Then I decided against it. Dropped again last night, and I still can't bring myself to use it. I'm using Mask of Distant Memory at the moment and much prefer the looks and don't mind the stats. Oh well, hate me if you want. There's a lovely little tick box in the Interface Options menu that says "Show Helm". Uncheck it. Problem solved. No longer appears to use the red skin for the set, as of 6.2.3 (maybe earlier), not sure if unintentional or not, trying to find out. http://i.imgur.com/2Pa6EaF.jpg - SS for proof, uses the brown skin from what I can see.